ICAR AIEEA Application Form 2019: Indian Council of Agriculture Research (ICAR) will conduct All India Entrance Examination for Agriculture 2019 (AIEEA) to provide admission in the field of Agriculture and Technology for various undergraduate, postgraduate and doctorate degree courses for the academic session 2019-20. The application form filling will be started from the month of May and will last to June. All interested and eligible candidates can apply for AIEEA UG Application Form through online mode only. This entrance exam is organized at national level every year. In this article, we have provided the complete information related to the ICAR Registration Form, apply online last date, eligibility criteria etc. 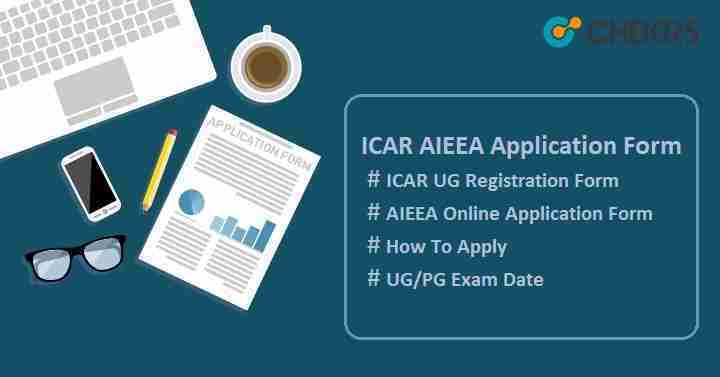 Candidates must check the listed ICAR AIEEA Admission Criteria before applying for the ICAR Online Registration Form. The minimum age of candidates should be 16 years. Aspirants must have completed 10+2 from any recognized board with at least 50% aggregate marks for GEN/ OBC & UPS category candidates whereas for SC/ST and PD candidates, it must be 40%. Candidates must have Physics, Chemistry as compulsory subjects with any one of the Mathematics/Biology/Agriculture. To apply for subjects from Stream A, candidates should have Physics, Chemistry with Biology/Agriculture. Applicant, who wants to select stream B subjects, should have subjects like chemistry, physics with mathematics. Both final year candidates & appeared candidates in last year qualifying exam can apply for AIEEA 2019. Candidate must be Indian in Nationality. Candidates must be born as on or after 01.09.2000. The candidate should have completed a bachelor’s degree from any recognized university in which the minimum required percentage for General, OBC and UPS will be 60%, whereas for SC, ST and PD candidates, it will be 50%. The applicants who are in final year can also apply. Candidates should have master’s degree certificate from any recognized university or institution. Click on the “New Registration/ Login” link available on the left side of the portal. Click on the tab “Proceed for Registration”. Select the programme AIEEA-UG, AIEEA-PG, AICE-JRF/ SRF99 (PGS) for which you want to apply. Fill the entire empty field with the basic information like name, date of birth, mobile no, mail id etc, and enter security code, tick on the declaration message and then click on “Save & Proceed”. If you want to modify the information, you can click on “Edit” button. A pop-up message will be generated on the screen with application no & password. Note down the application no and password for future use. And then click on “OK” to complete the application form. Moving to the application form page, click on the link “Click here for add address” to add the address and test center and then click on “Save & Proceed”. Now add academic qualification and then click on “Save & Proceed”. Then add scanned images of relevant documents like “Declaration Message” written on a white blank paper, photograph, signature & thumb impression etc in the accepted format. After uploading all the images, you can check the images size by clicking on the “Check your images size” tab. At last, click on “Return to My Page” and then click on the link “Pay Registration Fee”. Choose option between net banking/ credit card/ debit card, select bank and then click on “Proceed”. Click on “Pay Now” to submit the fees. Final step is to take the print of completely submitted ICAR AIEEA Application Form.